Ravensburg is located in southern Germany, Upper Swabia in the state of Baden Württemberg, near Lake Constance. Ravensburg sits in the shadow of the Alps to the southeast. Ravensburg has about 50,000 people. 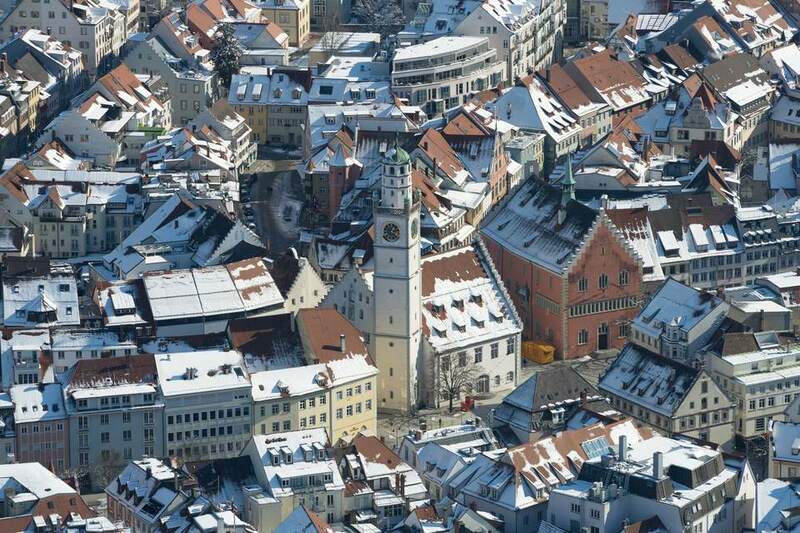 A trading town, Ravensburg was at the peak of its power in the 14th and 15th centuries. Ravensburg, the economic center of the tourist region around Lake Constance, is a good place to shop. Known for its city towers and gates, you can explore the medieval aspects of the small town in a day or two. Ravensburger is also famous for its games, puzzles and children's books, and each summer you can play the new games in Ravensburger Spieleland, the "biggest playroom of the world." Chocolate lovers can escape to the Ritter Sport Chocolate House in Spieleland. "Here you can find out all about the famous square chocolate bar, discover your favorite chocolate in the shop and make your own chocolate in the Chocolate Workshop. A unique chocolate dream on three floors!" Ravensburg can be reached by car or train. The closest airport is Friedrechshafen, 20 miles to the south. Larger airports are at Zurich (100 km) and Stuttgart (160). There are 70 direct trains from Ravensburg to Friedrechshafen airport. Public Transport Network to Bodensee-Airport, Friedrichshafen. Guided tours are offered from April to October, on Wednesday afternoon and Saturdays. Get details at the Tourist Information Office. Friedrichshafen is located directly on the shore of Lake Constance, and makes a great day trip, especially in the high season when most of the lakeside hotels are full. The hills around Ravensburg are great for day hikes as well. The Ravensburg youth hostel Veitsburgl is above the city on the road to Wangen at Veitsburgstraße 1. Ravensburg has a variety of hotels and apartments. Ravensburg is a wonderful town to walk around in. Head for the Marienplatz, the center of Ravensburg loaded with restaurants, cafes, and beer halls, and branch out through the traffic-free narrow lanes to discover the towers and gates that surround the old town. Climb the Towers: You can climb two of the town's towers for views of Ravensburg. The Blaserturm (51 meters high) from April to October; Monday to Friday 2 pm to 5 pm and Saturday 11 am to 4 pm. The Mehlsack (51 meters high) from April to October (apart from July) every Sunday from 10 am to 1 pm. The town's Protestant church was originally a Carmelite monastery from 1350 and contains 14th and 15th-century frescoes. Ravensburg's most popular festival is the "Rutenfest" in mid-year. At the end of the school year, there are many events within the celebration that the entire town participates in that aren't really meant for tourists, like the presentation of an award for the best female and male pupils. On the other hand, " beer gardens, beer tents, and food stands are open to the public in an area north of the old town called Kuppelnau." Find out more about Rutenfest Ravensburg.